Cherry shrimps (Neocaridina denticulata sinensis), are way tougher compared to any other shrimp varieties thus they are popular among hobbyists. They are relatively easy to breed and can thrive well in various water parameters. 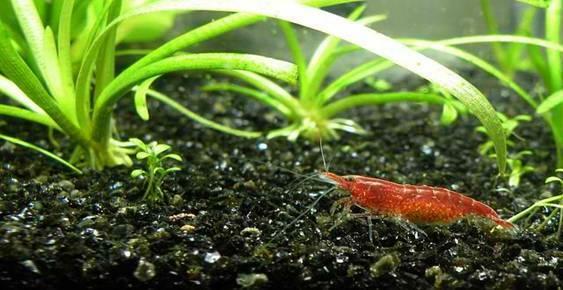 These are important reasons why newbies start out with cherry shrimps before moving on to the more challenging shrimp species like Tiger shrimp. They are also the least expensive shrimp species available in pet stores. Well-known for being hardy species, cherry shrimps can thrive in almost any habitable freshwater tank that does not have any potential predators. pH - they can be raised in a pH range of 6.0-8.0, with the optimum pH being slightly acidic (6.2-7.3). Water temperature - optimum water temperature is around 25-27C. Faster growth and reproduction are often observed in higher temperatures. Upper water temperature limit is 30C, at which level, the water needs to be aerated and overstocking should be avoided. They are known to survive at lower temperatures however they won't breed and may not be at their optimum health. Nitrites and ammonia - the level of nitrites and ammonia in tank water should be zero. The nitrate level does not necessarily need to be zero but it is desirable. Putting in aquatic plants and performing constant water changes can help keep levels of nitrite, nitrate, and ammonia down. Water change - a 30% water change should be performed every week, making sure to use a decholorinator and to let the water age before being added into the aquarium. This will guarantee the natural removal of toxic compounds like chlorine, from the water. With poor water quality, cherry shrimps can become stressed. When something is wrong, these incredibly active shrimps will become sluggish, and may not move at all. They will also swim to the water surface and freeze. When you spot any of these changes, you should check the water immediately, quickly addressing the problem, before it is too late. Cherry shrimps won't thrive well in planted tanks because of the excess carbon dioxide (CO2) that may be present in the water. They are unable to deal with the drastic changes in water pH as well as the lack of oxygen. However, if you decide to add cherry shrimps to a planted tank, make sure to constantly monitor the CO2 levels of your tank. Putting these precautions aside, planted tanks provide excellent cover for their offspring, and shrimp population have been observed to rise rapidly in these conditions provided the water parameters are well-monitored and maintained. They are also sensitive to copper additives and heavy metals, thus avoid using fertilizers that contain these components. Cherry shrimps thrive well with a balanced diet that includes fresh vegetables and processed foods, like flakes and pellets. A balanced diet is also important to promote breeding and reproduction. Feeding is best done at least once a day, giving just enough food for the shrimps to consume within 2-3 hours. Cherry shrimps will also feed on moss and some aquatic plants. My name's Peter Hartono and I'm the founder and CEO of Just Aquatic - a proud Australian company that offers homegrown aquatic plants and aquarium supplies carrying top of the line brands including API, biOrb and Exo Terra. To find out more of our exciting offers and promotions check out our Facebook Page and follow us on Twitter at @justaquatic.